Captain Head was an officer in the Queen’s Royal Regiment. After serving in India, he travelled home to England using a detour on what became the well-trodden Overland Route. Arriving from Qusayr from Jiddah and Bombay on 29 December 1829, he crossed the desert to the Nile, visited Thebes [Luxor], and travelled on down river reaching Alexandria on 18 February 1830. 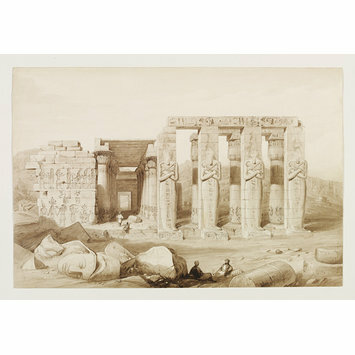 On his return to England he published Eastern and Egyptian Scenery, Ruins, &c (1833), a series of lithographs after his own sketches that showed the celebrated monuments accessible from the Overland Route. The Searight Collection contains five of these original sketches, including the one here for Plate 8, published with the title Ruins of the Memnonium, with Part of the Cemetery of Thebes. The temple's nineteenth-century name derived from the erroneous identification of its colossal statue with the Trojan hero Memnon. The statue in fact represents the Eighteenth Dynasty Pharaoh, Ramesses II, venerated in this temple. The head of another statue of the Pharaoh is seen in this view; its companion, removed from the site by Belzoni in 1816 (see below), inspired Shelley's poem, Ozymandias (1818). On the right are the Osiris columns of the first court of the temple. According to Rodney Searight: - `The 3 drawings [SD.496-SD.498] bt fr M. Strange, Aug.1978, £90'. 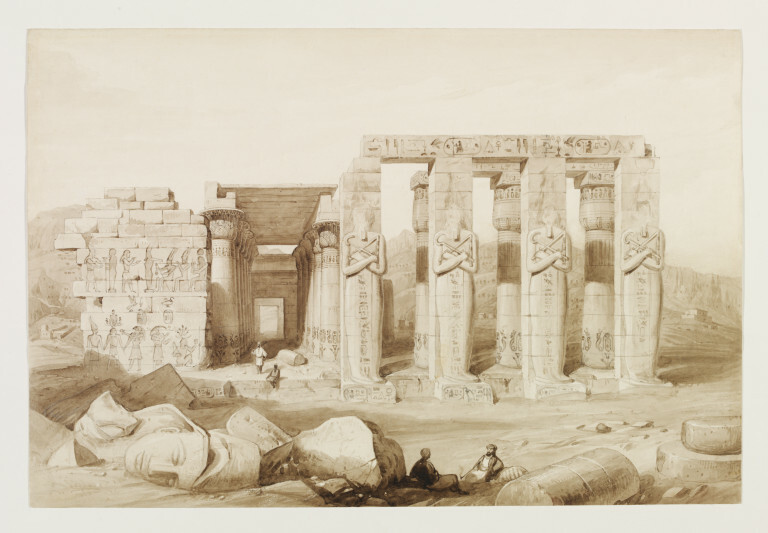 This is a drawing for the artist's Eastern & Egyptian Scenery, Ruins, &c., 1833, Pl. 8, facing p.22. It is one of a group of simliar drawings. [SD.494-SD.498]. The title given is that of the corresponding lithograph in Head's publication. [see SP.313]. Head arrived in Qusayr from Jiddah and Bombay on 28 December 1829, crossed the desert to Luxor, January 1830, and travelled up the Nile, reaching Alexandria 18 February 1830. For further discussion of his volume of lithographs after his sketches (SP.313) and of the Overland Route, see Searight Archive.